This year Patter is going through the alphabet for our Scripture Challenges. For this first one she chose the word "ANCHOR" for us to use. God in His perfect timing guided Patter in her choice as yesterday at Church the final song sang was "Will Your Anchor Hold in the Storms of Life". I have shared the first verse of the song on my artwork. "The reason for this message today is to encourage you with Hope and confidence as you face the challenges of this year. We do not know what lies before us this year - but one thing you can be sure of. When we place our Faith and Trust in Christ for Salvation we are anchored into Heaven itself - and all the resources we need for life and living are to be found in the person of our Lord Jesus Christ." For my digital art I used a kit called Sand and Sea by Nutkin Tailz Designs. Wow! Fantastic page and great word you had at church. I am joining in this year but I need to try to set up a SIMPLE blog which I haven't a clue how to do ! Hope I manage before the next challenge. What a beautiful page and lovely words of encouragement! 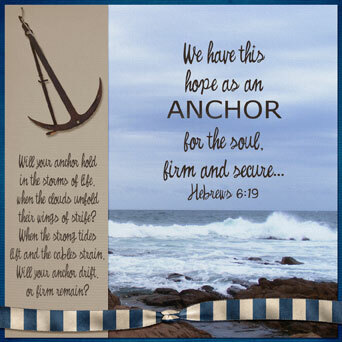 I found that the Lord has shown me more about the concept of anchor since I decided to do this project. He is so faithful! Exquisite, as usual. The beach photo brings it to life. Thank You. What a beautiful page! The background is gorgeous, as is your actual "Anchor." I love the way you used the ribbon. I really love the Scripture you used! More so, I really like what you shared about your message at church. That is so full of wisdom. Praise God for giving us this Manual for Life! I am doing Patter's ABC Scripture Challenge also. I invite you to visit the He IS Able blog. It exists to Give God the Glory. We have a card give-away every week. Leave a comment before 8pm Eastern Time, and you are entered in the random drawing. If your name is chosen, and you contact me with your mailing address before Tuesday 8pm the next week, you will receive the beautiful card shown on the side bar, an extra envelope & postage. We pray that the recipients who send the cards out will use them to help fulfill our Mission Statement. He IS Able: "Sharing His Love, His Word, and His Gift of Salvation through Cards." Stop by, and please check out the first post. Click, 2010, June and the post will show up. It explains how He made this blog what it is! Hope to see you soon! Thanks for sharing your page!